This April 13-14 Percona is introducing an annual conference called OpenStack Live. I’ve seen a few questions about the new event so decided to help clarify what this show is about and who should attend. Unlike OpenStack Summits, held twice a year and dedicated to primarily to developers, OpenStack Live is an opportunity for OpenStack evaluators and users of all levels to learn from experts on topics such as how to deploy, optimize, and manage OpenStack and the role of MySQL as a crucial technology in this free and open-source cloud computing software platform. A full day of hands-on tutorials will also focus on making OpenStack users more productive and confident in this emerging technology. Still confused about OpenStack Live 2015? Fear not! Here are the answers to commonly asked questions. if you are evaluating or considering using it. Q: Percona Live has a conference committee. Does OpenStack Live have one, too? Q: Are the tutorials really “hands-on”? A: Yes and most are at least 3-hours long. So you’ll need your laptop and power cord. Here’s a look at all of the OpenStack tutorials. Q: How meaty are the sessions? Q: I am going to attend the Percona Live MySQL Conference and Expo. Will my pass also include OpenStack Live 2015? A: Yes, your Percona Live pass will be honored at the OpenStack Live conference. OpenStack Live attendees will also have access to the Percona Live/OpenStack Live Exhibit hall, keynotes, receptions and FUN activities April 13 and 16, allowing them to dive deeper into MySQL topics such as high availability, security, performance optimization, and much more. However, the OpenStack Live pass does not allow access to Percona Live breakout sessions or tutorials. A: You can register here and take advantage of Early Bird discounts but those end Feb. 1 at 11:30 p.m. PST, so hurry! The post OpenStack Live 2015: FAQs on the who, what, where, when, why & how appeared first on MySQL Performance Blog. As the announcement from Qualys indicates, it is believed that MySQL and by extension Percona Server are not affected by this issue. Percona is in the process of conducting our own review into the issue related to the Percona Server source code – more information will be released as soon as it is available. In the interim the current advisory is to update your glibc packages for your distributions if they are in fact vulnerable. The C code from the Qualys announcement may aid in your diagnostics, section 4 of this document or via this gist. I also wrote a very quick python script to help identify processes which may be running libc that you can access here. Compiling the above and executing it will yield an output indicating if your glibc version is believed to be vulnerable or not vulnerable. Distributions which use musl-libc (http://www.musl-libc.org/) are not affected by this issue. The post GHOST vulnerability (CVE-2015-0235) Percona response appeared first on MySQL Performance Blog. The post Multi-threaded replication with MySQL 5.6: Use GTIDs! appeared first on MySQL Performance Blog. Percona University: Back to school Feb. 12 in Raleigh, N.C.
Percona CEO Peter Zaitsev leads a track at the inaugural Percona University event in Raleigh, N.C. on Jan. 29, 2013. About two years ago we held our first-ever Percona University event in Raleigh, N.C. It was a great success with high attendance and very positive feedback which led us to organize a number of similar educational events in different locations around the world. And next month we’ll be back where it all started. On February 12, Percona University comes to Raleigh – and this time the full-day educational event will be much more cool. What have we changed? Take a look at the agenda. 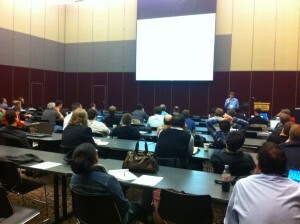 First – this is no longer just a MySQL-focused event. While 10 years ago MySQL was the default, dominating choice for modern companies looking to store and process data effectively – this is no longer the case. And as such the event’s theme is “Smart Data.” In addition to MySQL, Percona and MariaDB technologies (which you would expect to be covered), we have talks about Hadoop, MongoDB, Cassandra, Redis, Kafka, SQLLite. However the “core” data-store technologies is not the only thing successful data architects should know – one should also be well-versed in the modern approaches to the infrastructure and general data management. This is why we also have talks about Ansible and OpenStack, DBaaS and PaaS as well as a number of more talks about big-picture topics around architecture and technology management. Second – this is our first multi-track Percona University event – we had so many great speakers interested in speaking that we could not fit them all into one track, so we have two tracks now with 25 sessions which makes that quite an educational experience! Third – while we’re committed to having those events be very affordable, we decided to charge $10 per attendee. The reason for this is to encourage people to register who actually plan on attending – when hosting free events we found out that way too many registered and never showed up, which was causing the venues to rapidly fill past capacity and forcing us to turn away those who could actually be there. It was also causing us to order more food than needed, causing waste. We trust $10 will not prevent you from attending, but if it does cause hardship, just drop me a note and I’ll give you a free pass. This is very much a technically focused event. I have encouraged all speakers to make it about technology rather than sales pitches or marketing presentations. This is low-key educational event. Do not expect it to be very fancy. If you’re looking for the great conference experience consider attending the Percona Live MySQL Conference and Expo this April. Although it’s a full-day event, you can come for just part of the day. We recognize many of you will not be able to take a full day from work and may be able to attend only in the morning or the afternoon. This is totally fine. The morning registration hours is when most people will register, however, there will be someone on the desk to get you your pass throughout the day. Thinking of Attending? Take a look at the day’s sessions and then register as space is limited. The event will be held at North Carolina State University’s McKimmon Conference & Training Center. I hope to see you there! The post Percona University: Back to school Feb. 12 in Raleigh, N.C. appeared first on MySQL Performance Blog.